The Zika public health emergency illuminated a number of administrative preparedness challenges governments face when responding to such situations. The Center for Health Security has highlighted the importance of both providing adequate funding for maintaining the public health infrastructure, as well as having funding available to respond to emerging threats. Their recommendations included increasing funding for the Public Health Emergency Preparedness program (PHEP) and creating a one to two billion dollar public health emergency fund which could be made available upon the declaration of a local or state emergency. Diminished funding leaves state and local departments with limited resources to perform essential public health activities and engage in public health emergency planning and preparedness, as well as limited incentive to collaborate with other organizations. This has important implications for engaging in the type of administrative preparedness necessary for state and local public health organizations to adequately manage the logistics of an emergency response. Program staff with NACCHO’s Project Public Health Ready emphasized the importance of administrative preparedness. In addition to restrictions on the amount and use of grant funding, movement of grant funding from the federal to the local level is also an on going challenge. “In terms of financial movement of resources, that is 100 percent a challenge and one about which a conversation at the federal, state, and local level is taking place on an on-going basis at the moment,” a NACCHO staff member said. Another aspect of administrative preparedness is having memorandums of understanding in place regarding how to set up a point of distribution for countermeasures, according to a NACCHO staff member. Such efforts can be hindered when public health departments are not fully integrated into planning discussions. Among the recommendations of the Blue Ribbon Study Panel on Biodefense was increasing information sharing capacity among local, state, territorial and federal actors and creating a comprehensive framework for the distributing and dispensing of medical countermeasures. Cooperation can also be valuable to the procurement of new equipment and resources, according to a recent NACCHO report. The organization recommends local health departments incorporate cooperative purchasing and emergency purchasing agreements as part of their procurement strategy. One approach to cooperative purchasing that can be especially helpful in terms of time savings is piggy backing. This is an approach where other jurisdictions can share in the conditions of another jurisdiction’s procurement contract. In regard to emergency procurement provisions, Knox County, Tennessee is cited by the NACCHO report as an exemplar. The county has a manual outlining the rules governing emergency procurement. These rules include the need for an emergency coordinator and require complete and thorough documentation when routine bidding procedures are bypassed due to an emergency. There is widespread agreement good intelligence is important for an effective public health emergency response. However local health departments can find it difficult to manage reporting alongside other responsibilities. In a NACCHO report, they recommend lessening the burden of reporting by standardizing data collection standards and allowing data to be collected once for multiple uses. While good reporting is essential to having a clear perspective on an emergency, inconsistent and incomplete reporting can distort that picture. Establishing consistent standards prior to an emergency can prevent this. Local health departments are burdened by multiple requests for information, while state departments are burdened by acting as a conduit for reporting. NACCHO recommends following the Public Health Information Network standards and merging institutional and public reporting processes. Along with reporting, real time analysis can also be a burden. A paper by analysts with the Center for Health Security recommended the integration of environmental, animal and human health data to, among other functions, allow for the automated analysis of multiple streams of data to identify possible areas of common disease exposure. Another reason that collaboration between health agencies can be so important is to alleviate personnel shortages in the event of an emergency. A report by the Center for Health Security cites a NACCHO statistic that 51,000 local public health positions have been cut since 2008 due to lack of funding. 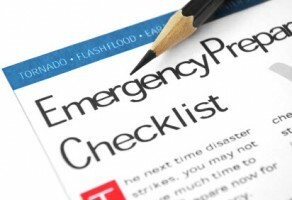 Setting up processes to facilitate collaboration prior to an emergency may prevent undue interruption of services or danger to the ill. Local departments should foster partnerships with hospitals, home health agencies, universities, ambulance services and non-profits. Medical Reserve Corps units could be expanded and the ESAR-VHP system could be better utilized to allow for easier interstate and intrastate sharing of personnel during an emergency. Improving administrative preparedness will require identifying gaps in the current system and addressing them through collaboration with organizations that can assist with personnel, finances and logistics. However, changes to the existing system could allow for better utilization of existing resources. As suggested by NACCHO personnel and reports, areas such as procuring new equipment, reporting surveillance information and managing workforce are ones where better planning could significantly strengthen the system. Financial and human resources personnel should be incorporated into planning and exercises for this reason. Other health security organizations highlight countermeasure distribution and information analysis as well. Alongside increased funding, public health administrative preparedness should be on the agenda of federal, state and local public health officials.